The Manes and Tails painting party is sold out! Everyone who registered to date has a place at the Tuesday, Feb. 28, event. Promises to be a fun event. Looking forward to seeing close to 50 of you there. Contact organizer Vicki Andrews with questions. Saddle up for Manes & Tails on Canvas, Tuesday Feb. 28, beginning at 6:30 p.m.
at Cheddar's, 2085 Interchange Rd, Erie, PA 16509. Call and take the reins to reserve your spot by contacting Colleen Welka, owner of art ERIE barn, (330) 350-0193. Send a photo of your own horse to Colleen via text and she will create a one-of-a-kind, black-and-white, paint-by-numbers-style canvas for you to stomp your unique hoof print on. Photos due by Feb. 19. Upcoming programs for EHSC. Our new programs chair has some exciting events coming up for our club members to have the opportunity to socialize and spend time together, as well as attend some educational programming!! So what is coming up? So you can see that Vicki has put a great deal of effort into scheduling these programs. What better way to spend a cold winter evening than with your EHSC friends and future friends!!! See you there!!! 4 adult styles as shown, same available for youth except colors on left are red and royal blue. No adult S left in any style. Have XS to 2XL. Soft, washed feel. $15 each. Contact Heidi Zuck for details and delivery. Wow! August is here already, with the summer winding down. We are fast approaching September and it is time to start thinking about election of our Board. 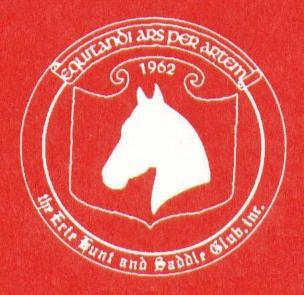 I have had the privilege of serving on Erie Hunt and Saddle Club’s Board as Membership Chairman. 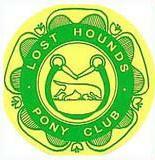 My experience has been very rewarding and I am impressed with the dedication to horses and to the club members. Please consider serving on Erie Hunt and Saddle Club’s Board. Serving on the Board is a wonderful opportunity to support the growth and direction of the Erie Hunt and Saddle Club. The full description of the operating Chairmen is listed in the By-laws. Giving back to the club, having an input with decisions and a having free membership are among the benefits! Please feel free to contact me for more information. The open positions are Award/Points, Programs, Sponsors, Grounds and Volunteer Coordinator. Thank you! A crowd of more than 30 riders gathered at the nonprofit Erie Hunt and Saddle Club Friday night for some gaming. Classes in barrels, pole bending, keyhole, and chug-a-lug are just a few of those offered, with payback for open and jackpot classes, "Horsemanship Through Knowledge" since 1962, 6840 Old State Road, Edinboro PA 16412. In preparation for our annual Horse Trials – the second-oldest running trials in the United States – Erie Hunt and Saddle Club President Peg Hull will be on the grounds every day this week from 10:30 a.m. to 5 p.m. at the clubhouse, 6840 Old State Road, Edinboro PA 16412. “Please help where you can,” Peg says, adding with a wink, “Stop on in and I’ll give you a job.” Peg’s number is 397-8381. ~This Tuesday, Karen Copus need help setting up the dressage ring starting at about 5 p.m.
~This Wednesday, Lew Trumble needs help setting up the jump course starting at about 2:00 p.m.
~This Thursday, we need help setting up tents and decorating the cross-country course. ~And, especially this Friday, check the list on the bulletin board in the clubhouse for the to-do list. We will be ready for our most exciting annual weekend by 3 p.m. this Friday. ~The dress code for the Mini Horse Trials is: You may ride dressage in a short-or-long-sleeved shirt with a collar that should be tucked into your pants. If the pants have belt loops, you need a belt. Jodhpur boots with jodhpurs and tall boots or designed-to-match chaps or jodhpur boots are permissible. Braiding is optional. ~The entry fee for all the divisions is $55. ~The stabling fees are $35 a night (Saturday, 10 a.m. to Sunday at 7 p.m.) The stabling fee for the entire weekend (Friday, 5 p.m. to Sunday, 7 p.m.) is $45. Tack stalls are $5 a night. The late entry fee is $20. ~The new closing date for entries is Wednesday, August 17th. Please ignore the discrepancies in the 2016 Showbook regarding the above information. The Combined Test will be held Saturday, August 6th starting at 8:30 am with the Intro Junior division. The Showbook listed the dressage test as test A, which is incorrect. All competitors will be riding TEST B. The Jumping Derby will be held Sunday, August 7th, starting at 10:00 am. This year, due to only receiving entries for the lower divisions, we will only be offering Intro, Baby Beginner Novice, and Beginner Novice divisions at the Jumping Derby. We will gladly accept post entries the morning of the Jumping Derby up to 9:00 am for those divisions only. Please find the links on the Horse Trials Page. The link to the ride times are on the schedule page. Erie Hunt and Saddle Club July 2016 Newsletter is ready to view! Mark your calendars: The Erie Hunt and Saddle Club will be one of the nonprofits you can donate to Tuesday, Aug. 9 from 8 a.m. to 8 p.m. through Erie Gives. Your donation will then be matched up to a certain percentage and will really help the club. Our club supporters and volunteers always step up to the plate. We know we can count on your support! Please watch our Facebook page, website and e-mail for updates. You may click on the button here to donate. Donations can also be made by phone by calling the Erie Community Foundation at (814) 454-0843. The annual Horse Sports in Erie-Erie Hunt & Saddle Club Hunter show was exciting, full of competitors and their families, and just plain fun. Held July 2 and 3 weekend, there were 200 to 300 people on the EHSC grounds at any one time. Oh, and close to 100 horses. The weather was equine perfection: neither too hot nor too cold. Thank you to all club members who volunteered their time to help. This year we had a ringside food stand during the show instead of food in the clubhouse. It proved quite successful, increasing profits up from more than $200 from last year - and kept everyone fueled up with good food and drink. Kudos and thanks you to Barb Nash and the ladies who ran the stand over the weekend! A barn picnic kicked off the activities for the weekend Friday night with hamburgers and hot dogs smelling and tasting great. The club grill worked hard, and well, providing tasty staples. All sorts of desserts were made, brought and devoured. It was great camaraderie and a good start to the weekend. The show ran smoothly, thanks to the show staff and volunteers. Competitors and spectators alike enjoyed a pizza party on Saturday evening, sponsored by Horse Sports and EHSC, while watching the Derby action on the grounds. The Derby proved to be a challenge for many of the competitors.. EHSC club member Isabella DiNicola successfully navigated the first round course, earning a score of 85! She held her lead through the second round to end up the Derby winner. Sunday morning started promptly at 8 a.m., though many competitors were on the grounds and preparing horses by 6. Ah, the life of the passionate horseman! A highlight of the day is always the $100 Winner-Take-All Egg & Spoon Class, sponsored by Peg & Jim Hull and Hullbrook Arabians. Courtney Gramlich, from Slippery Rock, worked hard to beat club member Ava Tierney, and to take home the loot. Both were fierce competitors. Congratulations also to club member Sydney Richmond on her Championship in the Short-Stirrup division. By winning champion in that division, Sydney also won the Scamp Memorial trophy, donated by past members Joyce Jagielo and Julia Jagielo-Miller. This trophy is in memory of Scamp, who was a lesson horse at Brenric Stables for many years, and who introduced many young people to the joys of horse showing. Another competitive class on Sunday was the Francis Gannon Memorial Medal. Francis was a long-time member of the club, focusing on the kitchen, always creating a menu that was thoroughly enjoyed by competitors at the many club activities. The winner of the Francis Gannon Memorial Medal at the Sunday show was Laura Mefford. Congratulations Laura! If you weren’t able to attend the show, we hope to see you next year. Hunter Pace season is going to be upon us before you know it. Hopefully many of you will be out to enjoy the club grounds during the hunter paces. It is always great to see faces we may not have seen at other activities during the summer. Start conditioning and getting ready for the paces! Also, get your costumes ready for the Costume Pace and/or your best recipes tuned up for the Tailgate Party! There are several other activities and events coming up soon at the grounds. The EHSC Horse Trials is in August. Your phone may be ringing, looking for help getting ready, jump judging, helping with stadium jumping or any of many other necessary tasks to prepare. Lost Hounds Pony Club member, Kelly Tighe recently competed in the Theresa L. McDonald Scholarship at the Intercollegiate Horse Show Association Nationals in Lexington, KY.
Katharyn Stefanovski, also of Lost Hounds Pony Club, was the recipient of the Tri-State Region Chestnut Ridge Scholarship, a fund which helps members prepare for and offset costs of their National Certifications. 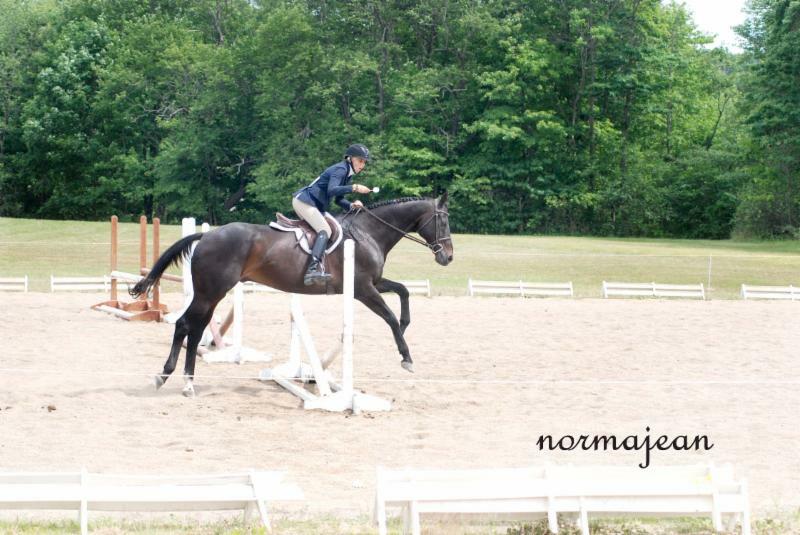 ~Our nonprofit Erie Hunt and Saddle Club has more than 50 acres of riding grounds, three rings with excellent footing, 110 stalls, clubhouse with kitchen, electric and water supply on the grounds. The course maps are posted on the Horse Trials page and below. I just wanted to give everyone a quick update on the Erie Hunt and Saddle Club HT. Entries are continuing to come but I would love to be drowning in paperwork! The weather has been great and because we did not run on the course in June the footing is great as well. In case you weren’t aware, the Saddle Club has added another large sand ring for Dressage and SJ warm up. The improvements just keep coming! We offer levels from Starter to the newly added Intermediate/Preliminary division. Our prices are very affordable from the entry fee to the stabling. The food is always great and we are even offering a breakfast menu starting at 6:30am. And don’t forget the big Pig Roast Competitors Party Saturday after XC which shouldn’t be missed! So, if you haven’t entered or are on the fence about entering, we would love to have you and your horse join us in August for what is sure to be a GREAT weekend!! If you have any questions or concerns, please don’t hesitate to contact me at gwndean@gmail.com . 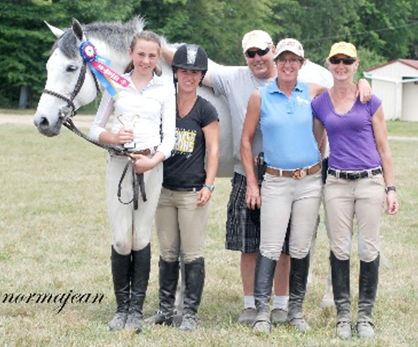 The hunter show at Erie Hunt & Saddle Club is this coming weekend, July 2-3. I am looking for help on Sunday, working with Barb Nash in the food concessions. We are going to run a food stand this year, nearer to the rings, to make accessibility easier. I am looking for a couple of people to help out with this. Please call or email me to let me know you are available. My phone number is 814-434-3319, and my email is lewtrumble@aol.com . The hunter show is a fairly significant source of income for the club, and with the loss of the LHPC Horse Trials we need to do what we can to cover the financial loss of that. I am also looking for someone to sit with Peg Hull in the announcer stand on Saturday. Any time you could give, so that Peg has breaks, would be appreciated. Additionally, some help on Friday afternoon and Sunday morning, in the show office would be beneficial. This is to aid in taking entries, etc. And of course, help on Sunday, around 3:30pm, we can use help tearing down and putting the grounds back to “normal”. If you’re not able to help lout, but are willing to donate something to the concession stand, that is also helpful! Donations can be dropped off in the clubhouse Friday afternoon. Cases of water, soda, and any types of desserts are helpful!! Thank you in advance to those of you who are able to give some time to the club!! Again, call or text me at 814-434-3319 or email me at lewtrumble@aol.com . Hope to see you all this weekend!! The Prize List, and show information including schedule and entry forms are posted on the schedule page and on the MHJA website.